I went to the preview night of The Red Shoes at The Podium last night primarily because the venue is walking distance from our place. The second reason I went is because I was curious about the film. To be honest, I haven’t seen a poster of the movie prior to last night’s screening, so I was absolutely clueless about it. Thanks, Nuffnang, for the invite! Lucas (Marvin Agustin) stole a pair of former first lady Imelda Marcos’ shoes when he was a little boy and gave it to the two most important women in his life, his mother (Liza Lorena) and his childhood sweetheart Bettina (Nikki Gil). 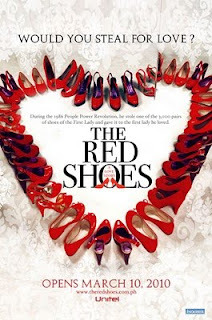 The story started with that pair of red shoes and ended with the same pair (with a twist!). The characters in the story are represented by their favorite shoe color. The main theme is moving on, which the main character Lucas has finally learned to do when he decided to change the color of his shoes in the end. The screenplay was well-written, the actors/actresses gave a fine performance, and the movie is loaded with metaphors, which make it doubly interesting to watch. The Red Shoes opens on March 10, 2010. Incidentally, I also met Pie in last night’s movie preview, and she took this photo of us. I hope to see her again in future events. This entry was posted in Movie Preview, Movies, Nuffnang, The Red Shoes. Bookmark the permalink. will be looking forward to this movie..
i have no idea about this movie. i saw this in one of blogger's update and thought it was red shoes on sale.. thanks for sharing. wanna see this movie too.. interesting. I was suppose to watch the movie. Been invited twice by Nuffnang but the first invite I was not available the second time last friday I totally forgot about it to think I just come from a make-up event. Sayang. I was wondering maybe you would like to join my contest Thanks.